Chasing The Dead – The Next Crime Fiction Best Seller? Posted December 17, 2013 by backupwp & filed under Guest Post. 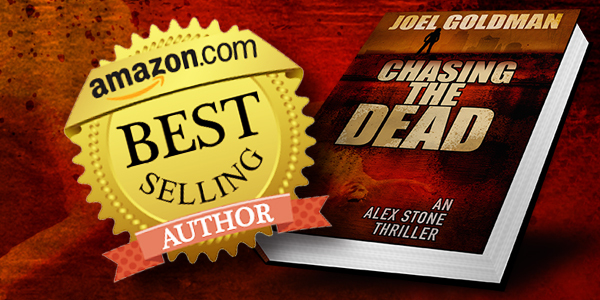 I was lucky enough to get my hands on the Advanced Readers Copy of Joel’s latest Alex Stone novel, Chasing The Dead, a few weeks ago, and I’ve been mulling it over ever since. I feel a review coming upon me. I’d love to know what my fellow crime fiction fans think about it. And I thought it’d also be interesting to take a look at a couple more high profile fictional heroines involved in the often-murky, intricate, fascinating world of crime, the law, and justice. We’re lucky in Brighton, UK, where I live, to have a thriving, vibrant lesbian and gay community. Our city is famous UK-wide for its tolerance, acceptance and appreciation of people who are a bit different. Walk through the city centre any day of the week and you’ll spot several men in dresses and at least as many trannies. So I’m not the least bit shocked or disturbed to discover a series of novels starring a lesbian public defence lawyer. Who knows what the rest of the world thinks? But as far as I’m concerned, Alex is a winner. She’s gruff, tough, resilient, driven and troubled, a blend of confidence and a lack of it, who makes an idiot of herself often enough to seem real. She’s scruffy, as far from elegant and well-groomed as it gets, and she’s truly, madly and deeply in love with her partner, the gorgeous Bonnie. Alex loves and hates her job in equal measure, but at least she feels it. There’s nothing less convincing than a perfect, un-flawed hero who approaches the worst in death, disaster, despair, cruelty and violence without so much as batting an eyelid. She hurts, she fucks up, she makes awful decisions, she gets in deep water, and she takes the consequences on the chin. She doesn’t always make friends in the process, but the friends she makes are loyal. And now and again, she kills. This time around Alex finds herself in terrible trouble, accused or cold-blooded murder, squeezed between a vengeful cop, a dirty judge and a particularly poignant murder, desperate to protect her lover but desperately out of her depth. I love the way Joel has developed her character so fluently in such a short space of time – this is, after all, only the second in the series. And I particularly love the last few lines, which left me hanging, forced to wait for the next instalment but not sure I could stand the delay. That’s the way to do it! As far as I’m concerned it has all the ingredients needed to become a genuine crime fiction best-seller. But what do other readers think? I went in search of reviews of Chasing The Dead, and this is what I found. “Chasing the Dead” by Joel Goldman is a solid mystery thriller in the stripped down, built-for speed James Patterson mold. Set among Kansas City’s prostitutes, homeless and all-powerful, this the second of Goldman’s “Alex Stone” series. The first volume, “Stone Cold” became an international best seller and garnered the author some good reviews and award nominations. I think it’s a bad idea to come to a series in it’s sophomore outing because the characters were probably more completely developed, warts and all, when they were introduced in the first book. Goldman may assume we are familiar with the characters’ quirks and foibles and – aiming at that stripped down, James Patterson model – felt there is no need to restate that information here. I haven’t read the first novel and so have to make my judgment/recommendation on what’s before me. Although competent, professional, and graced with an insight into the legal system that only a practicing lawyer can give, “Chasing the Dead” struck me as a bit flat. What about similar crime fiction books with female heroines? If you like Kathy Reichs’ female character Temperance Brennan, you’ll love Alex Stone. As it says on Amazon: “Fans of TV’s CSI: Crime Scene Investigation should be in heaven, stepping into the world of forensic anthropologist Dr. Temperance Brennan, star of Kathy Reichs’ electrifyingly authentic bestsellers.” If you’ve seen the TV series Bones, which is based on the novels, you’ll know all about her. Mark my words, she’s a seriously scary lady. I, for one, would not trifle with her. Similar to Alex Stone, she’d make an exceptional friend but a formidable foe. If, like me, you feel Crais’ work has a cinematic quality, it’s probably because that’s where he cut his crime fiction teeth. He has written scripts for major television crime series including Cagney & Lacey and Miami Vice, and won an Emmy nomination for his work on Hill Street Blues. I get the same clarity of vision from the Alex Stone novels, which I reckon would make really good telly. Who is your favourite crime novel heroine? Who’s your best-loved crime novel heroine, and why? If you haven’t added Alex Stone to your stable yet, give her a go and let us know what you think. As far as I’m concerned, you’ve got a real treat in store. Chasing the gold looks like a great book. I wonder if they have it in audio version?